Yes, Virginia, there is a Rabbit, Rabbit, Rabbit! Today has been a two-post day. If you didn’t see today’s earlier post yet, I hope you’ll scroll down to it. If you do, I think you’ll enjoy the video. Ever since I can recall, members of the Gunderson family (I should say those who are in the spirit of participating) have indulged in the practice of saying “Rabbit, Rabbit, Rabbit” as their first words after midnight the first day of every month. It can be said immediately at the stroke of midnight, or when awakening in the morning. Anyone successful in saying “Rabbit, Rabbit, Rabbit” in this manner is due good luck for the rest of the month. Now, I tell you…this is tried and true. After all, in December of 1987, Abby, Katie, Bill and I all said “Rabbit, Rabbit, Rabbit” on the first day of that month before saying anything else. It turned out that that very same month the negotiation process for purchasing our Perry home was complete. I’m sure that anyone who might have been skeptical of the good fortune following the saying of “Rabbit, Rabbit, Rabbit” can see that no more proof is needed than our December of 1987 example. Mother (Marion Gunderson) was the first person in the Gunderson family to be aware of this practice. I’ve asked four members of my Gunderson family if anyone knows who made Mother aware of it. No one does; however, Daddy (Deane Gunderson) thinks that she was aware of it since she was a little girl. Grace periods can come in so handy. Every once in awhile, it is just beyond a person’s control to say, “Rabbit, Rabbit, Rabbit” before other words come spewing out of one’s mouth on the first day of a month. Because of this, there are proclaimed (by moi) grace periods. There are all kinds of grace periods that fit different criteria for why a person might not have been able to say RRR in time. However, these are not meant to be taken lightly. If they are, or if they are used too often, they become as ineffective as the cries by the Little Boy Who Cried Wolf. Around midnight just before the first day of each month, between three of my sisters and myself, one of us always sends to the others and extended family an email that includes a photo of three rabbits. We sort of take turns, altbough I think I have only twice been the sender. 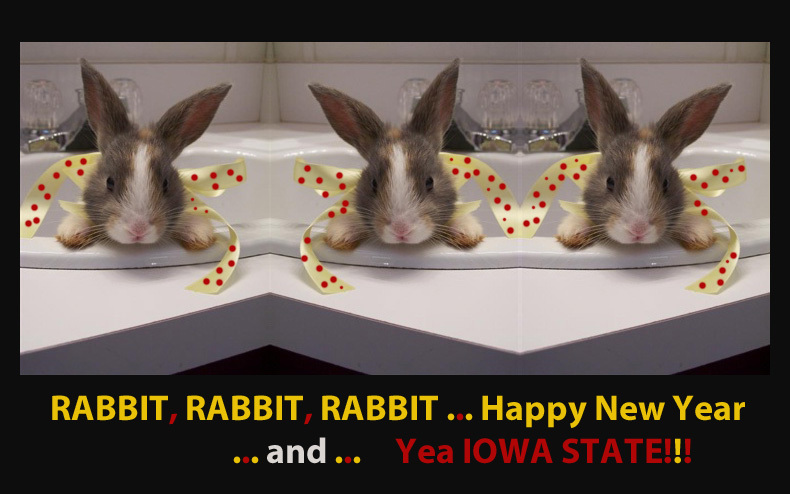 Last night, when I sent the above photo after Iowa State won its bowl game, was one of those two times. The four of us, as well as nieces and nephews, have fun with RRR, with fond thoughts of Mother/Nanna as we do so. This entry was posted on January 1, 2010 at 5:10 pm and is filed under Uncategorized. You can follow any responses to this entry through the RSS 2.0 feed. You can skip to the end and leave a response. Pinging is currently not allowed.